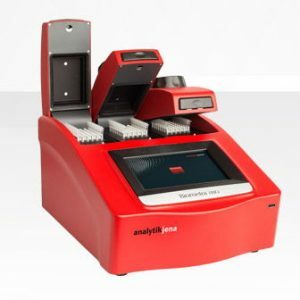 The Biometra TAdvanced Thermal Cycler is available with different block formats. The Quick Block Exchange technology allows an easy exchange of block modules in a few seconds. All blocks are made of aluminum and offer high ramp rates for fast protocol running times. Additionally, to achieve ultimate performance, a 96 well block made of silver is available. Due to its excellent heat conductivity, silver equilibrates extremely quickly, thus providing maximum speed and temperature uniformity. To protect the valuable silver blocks against corrosion, the block surfaces are gold plated. By the rubber sealing at the lid an encapsulated space is formed when the lid is closed. 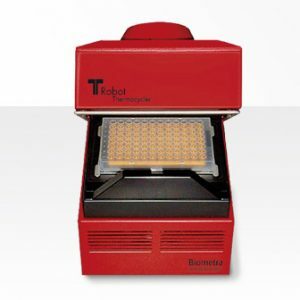 The closed room serves to improve the temperature uniformity of the sample block and avoids formation of condensed water at the final PCR cooling step. Furthermore all blocks are perfectly sealed to prevent condensed water from penetrating the Peltier elements underneath the sample block and other parts of the electronics. The Peltier elements are protected by the perfect sealings. This guarantees a longer intrument lifetime. The Biometra TAdvanced heated lid has been optimized to heat twice as fast as with older models and thus helps to shorten protocol run times. Moreover the heated lid serves for two additional essential functions: It prevents the formation of condensed water at the reaction tube portion located above the block surface level and it ensures reliable contact between samples and thermal block by applying constant pressure. By the integrated clutch mechanism the pressure applied to the reaction tubes is always same regardless of the plastic ware height. The combination of the heated lid shape and the reliable contact pressure ensure an even temperature distribution between samples thus significantly improves the temperature uniformity. With one press on the front button, the lid gently swings open and arrests in its end position. By this mechanism the lid cannot fall down and the heated lid is out of the radius of action when the user is inserting tubes or plates. Thus the risk of injury by violent pressure or the risk of burn by hot surfaces is prevented. 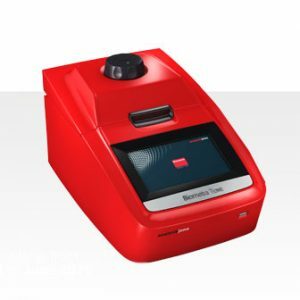 The Biometra TAdvanced Thermal Cycler features a 7“ state of the art color touchscreen user interface. The touchscreen is built-in at a flat angle to ensure reflection-free viewing and ergonomic programming. For programming of PCR protocols, the software incorporates Biometras proven spreadsheet philosophy and additionally a graphical programming mode. One touch leads from the spreadsheet to the alternative graphical programming mode. This makes the creation of new or editing existing of programs fast and easy. 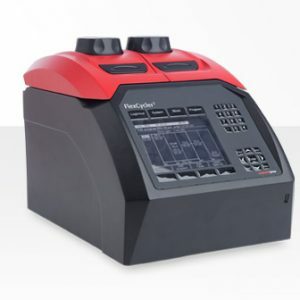 Many other thermal cyclers offer a so called “latest program list”. In the latest program list a certain number of PCR programs is collected and offered for quick start. The list is typically ordered only by date and the user has to search for the desired program. In contrast the Biometra TAdvanced software creates a user specific list and only the latest programs started by the currently logged-in user are offered for quick start. Even a lab member does not use the instrument for a longer time the information on the latest programs started by this user will not get lost. For maximum convenience the Biometra TAdvanced software features additionally features the program preview. Before start of a program the protocol steps are summarized in a clearly arranged table by the program preview tool. The program preview therefore provides a comprehensive overview on the protocol structure without the need to access programming screens. The program preview is also available before quick start of programs. For optimizing new primer pairs in a single run the Biometra TAdvanced optionally can be equipped with gradient function. Finding the best primer annealing temperature is crucial for the specificity and efficiency of PCR reactions. Often optimization of experiments is conducted only limited leading to unspecific byproducts or reduced PCR sensitivity. By using the gradient function new primer pairs with unknown annealing temperatures can be tested quickly and optimized in very short time. For maximum convenience the Biometra TAdvanced offers the Linear Gradient Tool. For most other instruments the temperature difference from row to row or from column to column in a gradient step varies across the sample block. The Biometra TAdvanced Linear Gradient Tool offers to program gradient steps with a defined temperature increment between the columns or rows. The Linear Gradient Tool option allows the comfortable creation of gradient steps and the best annealing temperature can be easily transformed to a non-gradient protocol. The software can manage up to 30 user accounts. By default three different user-levels are available: Administrator, user with generic rights and user with limited rights. However, in a comfortable menu the administrator can configure the settings for each user individually by activating or inactivating single rights. By the user administration tool in combination with the password protection of user accounts access to the instrument can be limited to authorized persons and unwanted modifications to the system settings and PCR protocols prevented. With each system start the Biometra TAdvanced performs an initial self-test and additionally the software offers an extended self-test that can be initiated by the user. The results of the extended self-test becomes are summarized in a protocol and are stored by the instrument. Additionally to the self-test functions the instruments creates and stores run-logfiles for each single run. For long-term storage run-logfiles and extended self-test protocols can be exported as proprietary file format. G = with gradient function 1 measured within sample block 2 applies only to cycler models with gradient function For more technical details please refer to the corresponding Technical Data sheets.